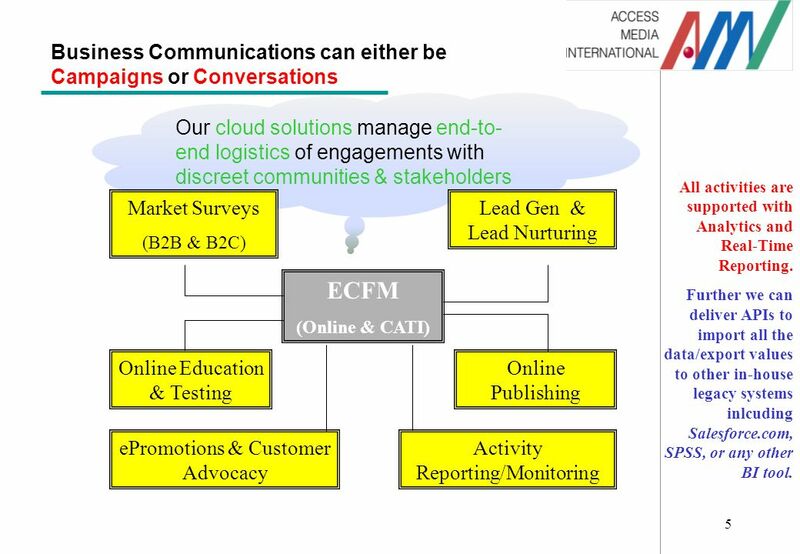 1 Enterprise Contact & Feedback Management (ECFM)Solutions creating Sustainable Business Relationships using Thoughtful and Structured Communication a. 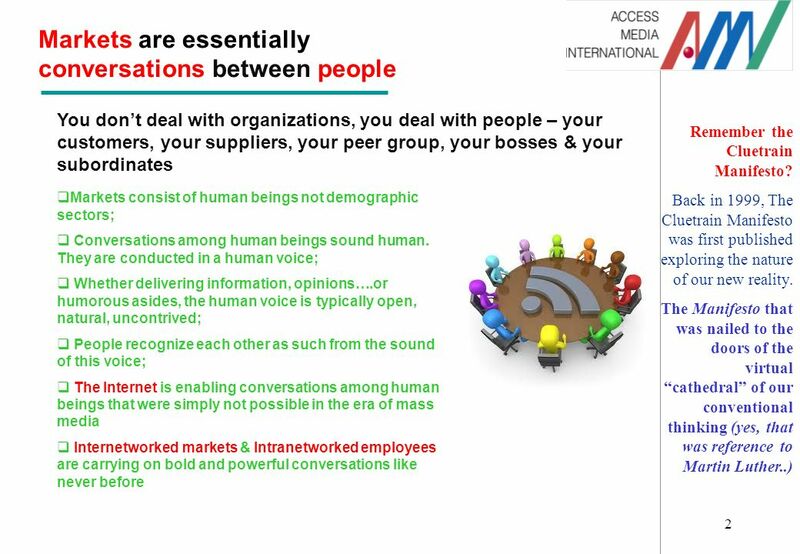 5 5 Business Communications can either be Campaigns or Conversations Our cloud solutions manage end-to- end logistics of engagements with discreet communities & stakeholders ECFM (Online & CATI) Market Surveys (B2B & B2C) Lead Gen & Lead Nurturing Online Education & Testing Online Publishing ePromotions & Customer Advocacy Activity Reporting/Monitoring All activities are supported with Analytics and Real-Time Reporting. 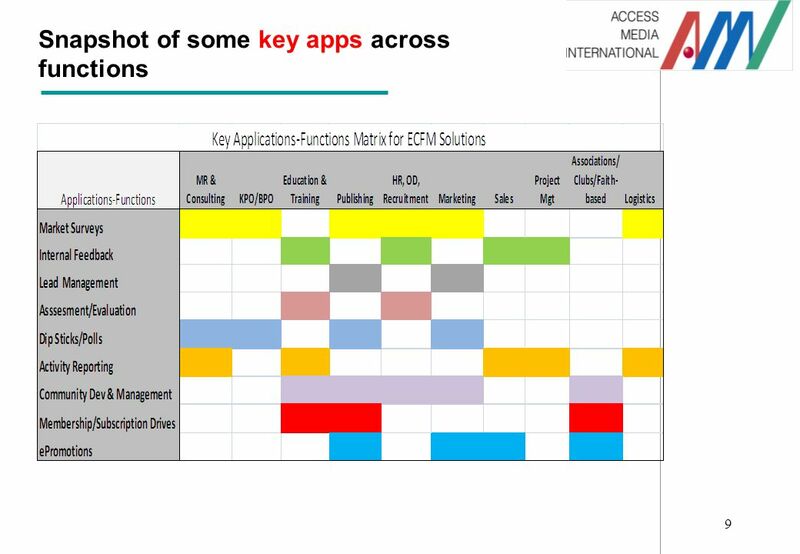 Further we can deliver APIs to import all the data/export values to other in-house legacy systems inlcuding Salesforce.com, SPSS, or any other BI tool. 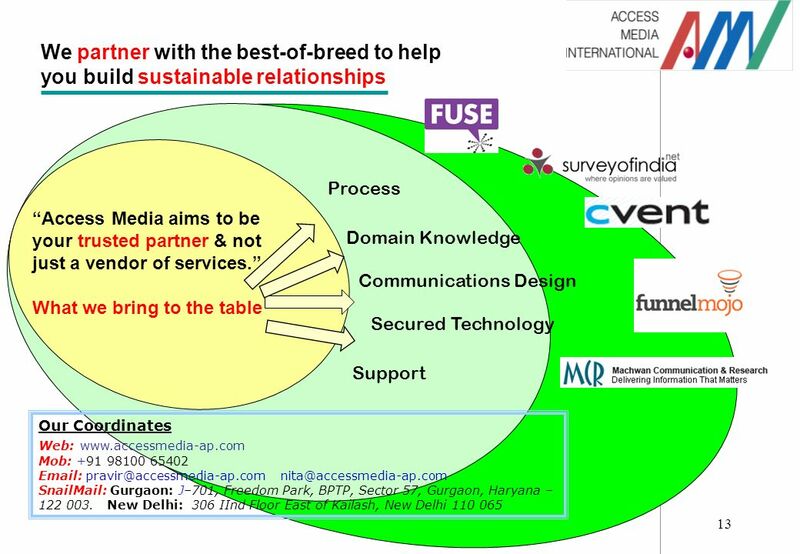 6 6 Some key features for Surveys, Assessments, Lead Gen & e-Promotions Embed Various Media – Ability to add images, audio, video to the survey. WYSIWYG HTML Editors - HTML editors provide an editing interface which resembles how the page will be displayed in a web browser Email Support & Phone Support – Same Business Day Support, escalated support Spam Detector – A spam filter is a program that is used to detect unsolicited and unwanted email and prevent those messages from getting to a user's inbox. 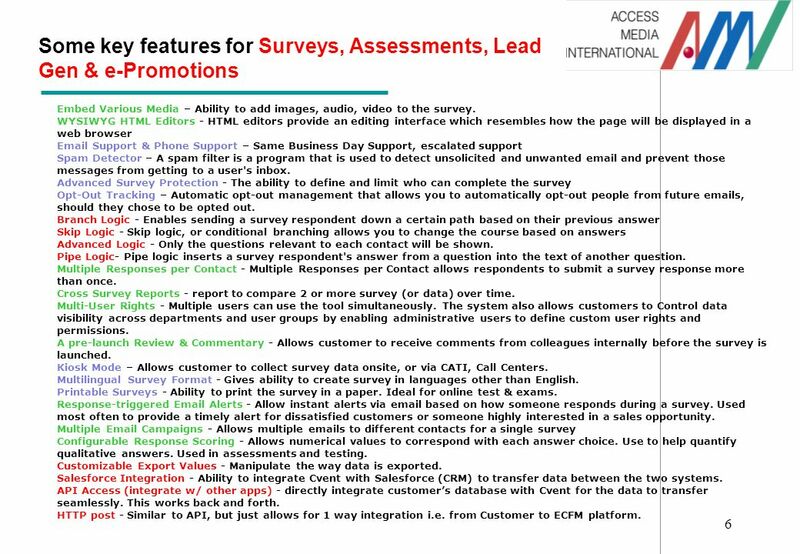 Advanced Survey Protection - The ability to define and limit who can complete the survey Opt-Out Tracking – Automatic opt-out management that allows you to automatically opt-out people from future emails, should they chose to be opted out. Branch Logic - Enables sending a survey respondent down a certain path based on their previous answer Skip Logic - Skip logic, or conditional branching allows you to change the course based on answers Advanced Logic - Only the questions relevant to each contact will be shown. Pipe Logic- Pipe logic inserts a survey respondent's answer from a question into the text of another question. Multiple Responses per Contact - Multiple Responses per Contact allows respondents to submit a survey response more than once. 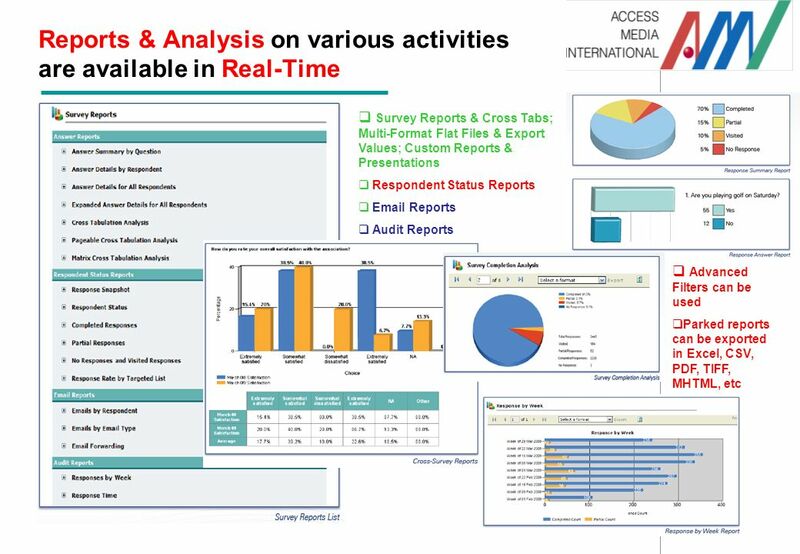 Cross Survey Reports - report to compare 2 or more survey (or data) over time. Multi-User Rights - Multiple users can use the tool simultaneously. The system also allows customers to Control data visibility across departments and user groups by enabling administrative users to define custom user rights and permissions. 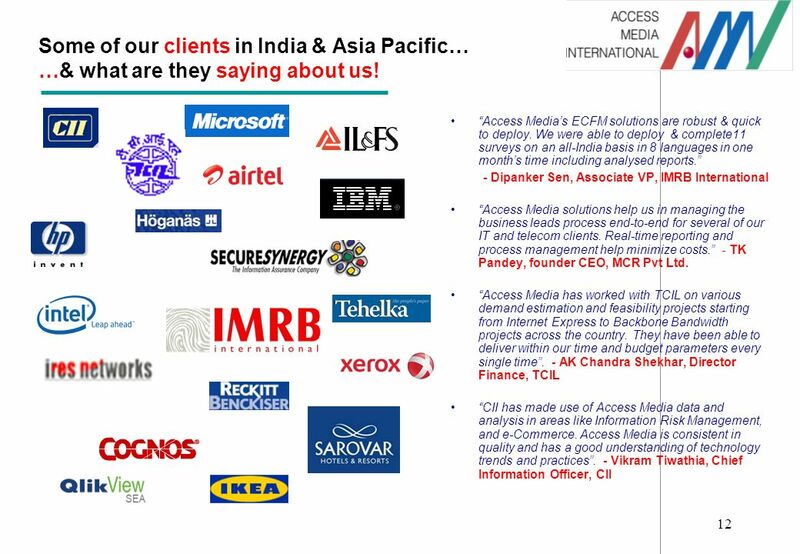 A pre-launch Review & Commentary - Allows customer to receive comments from colleagues internally before the survey is launched. 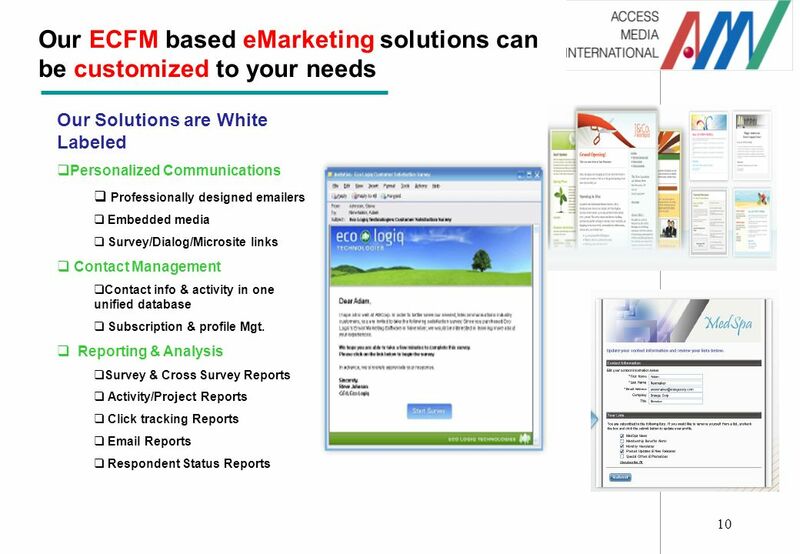 Kiosk Mode – Allows customer to collect survey data onsite, or via CATI, Call Centers. 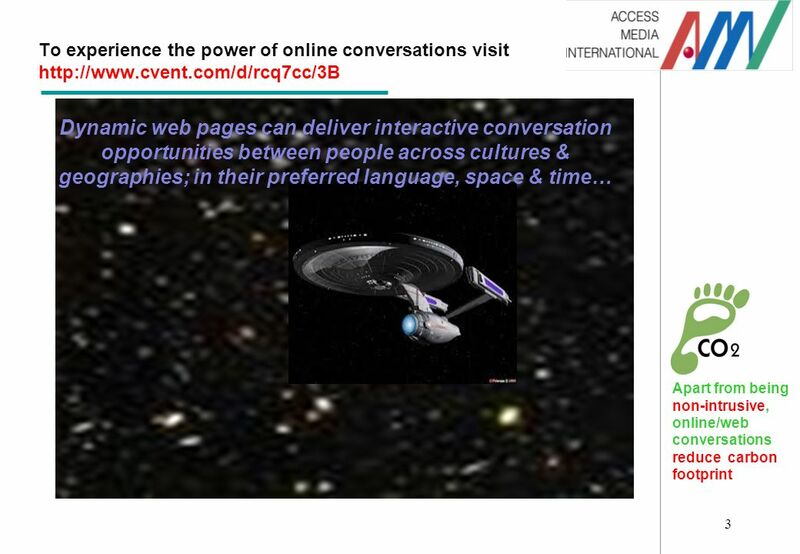 Multilingual Survey Format - Gives ability to create survey in languages other than English. Printable Surveys - Ability to print the survey in a paper. Ideal for online test & exams. Response-triggered Email Alerts - Allow instant alerts via email based on how someone responds during a survey. Used most often to provide a timely alert for dissatisfied customers or someone highly interested in a sales opportunity. Multiple Email Campaigns - Allows multiple emails to different contacts for a single survey Configurable Response Scoring - Allows numerical values to correspond with each answer choice. Use to help quantify qualitative answers. Used in assessments and testing. Customizable Export Values - Manipulate the way data is exported. Salesforce Integration - Ability to integrate Cvent with Salesforce (CRM) to transfer data between the two systems. API Access (integrate w/ other apps) - directly integrate customers database with Cvent for the data to transfer seamlessly. This works back and forth. HTTP post - Similar to API, but just allows for 1 way integration i.e. 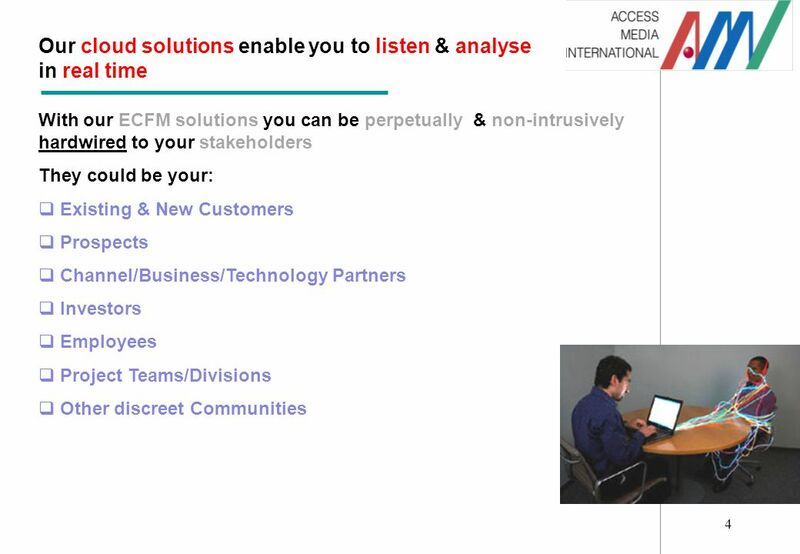 from Customer to ECFM platform. 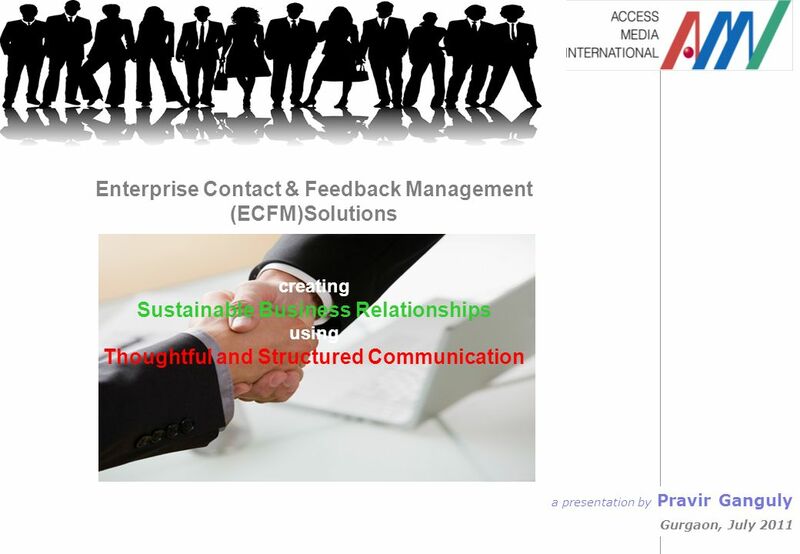 Download ppt "1 Enterprise Contact & Feedback Management (ECFM)Solutions creating Sustainable Business Relationships using Thoughtful and Structured Communication a." 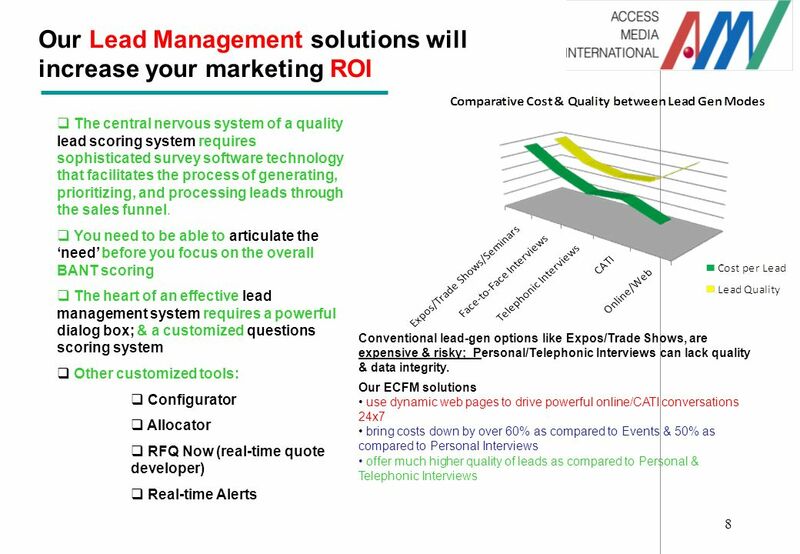 EasyDirector® Simplifying the way you manage your business... Full-Featured Contact & Customer Relationship Management Tool Prepared by AITechConsulting. 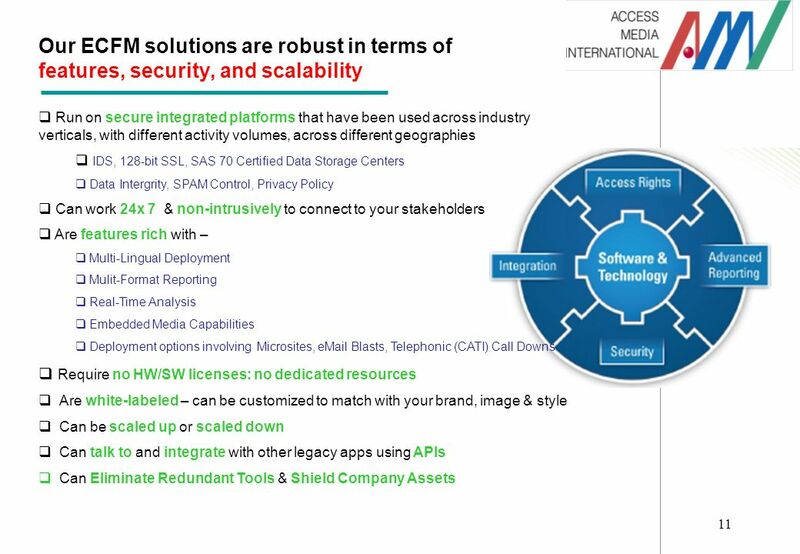 Aligning Support Process & Software With Customer Communication Preferences Rusty Coleman, VP Sales & Marketing This presentation advances on mouse click. Introducing the next generation of newspaper Personals People2People. SupportCenter Plus Product Overview. Overview 1.What is SupportCenter Plus (SCP) 2.Benefits of SCP 3.Licensing & Pricing 4.Questions. Conference.IBM.14 July 2006 Global Consumer Group Citigroup & WebSphere Customer Center Implementing Customer-Centricity in Financial Services Presented. Live dashboards for Progress built by anyone, available anywhere. Introducing DataPA OpenAnalytics Nick Finch CTO.